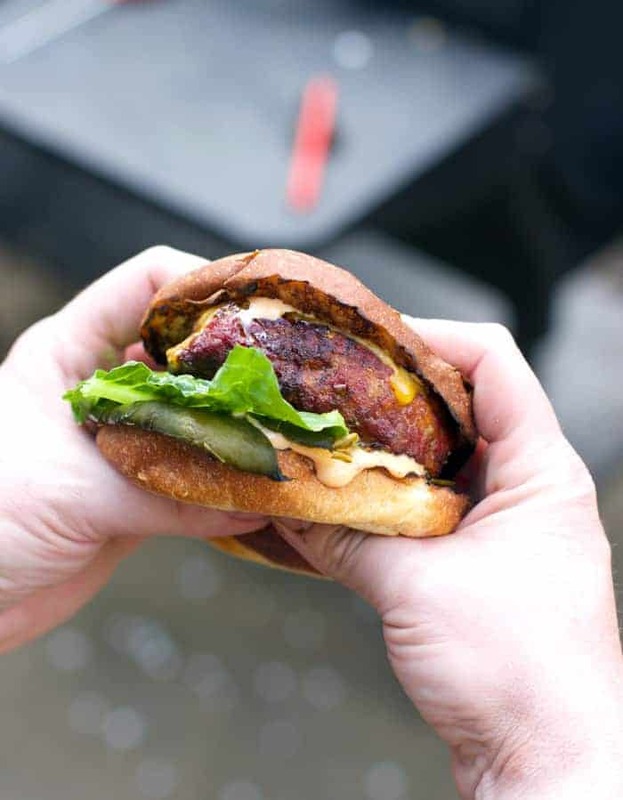 Our secret to smoking burgers with incredible smoky flavor and moisture with the perfect char on the outside. 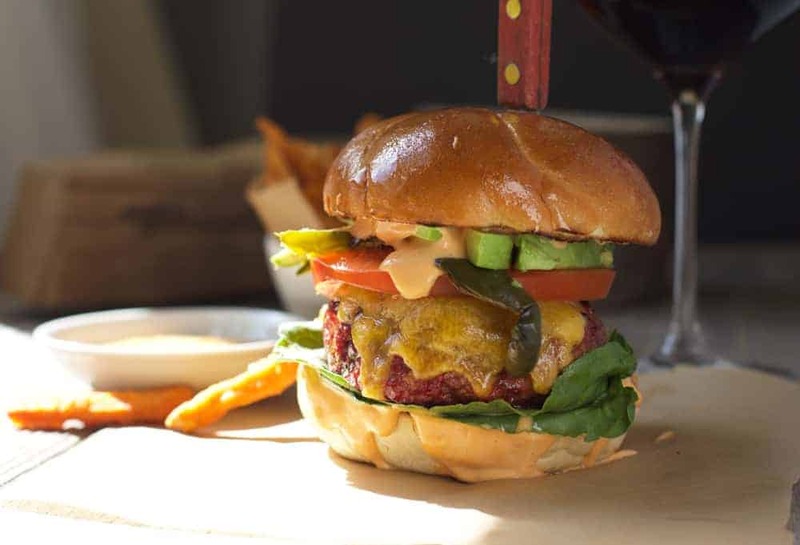 Plus a recipe for Smoked Mexican Burgers with Chorizo and Smoked Poblanos. I’ll be honest; I was never a huge homemade-burger-at-home kind of gal. I used to reserve those for restaurants that are known for really amazing juicy burgers. When we would do them at home I would usually do my best to try to be “healthy” about it (by using ground turkey instead of beef). If you remember, we do have an amazing trick to add incredible flavor to turkey (spoiler alert, it’s bacon paste). But for beef burgers, they had to be amazing for me to dive in and commit to making them at home. 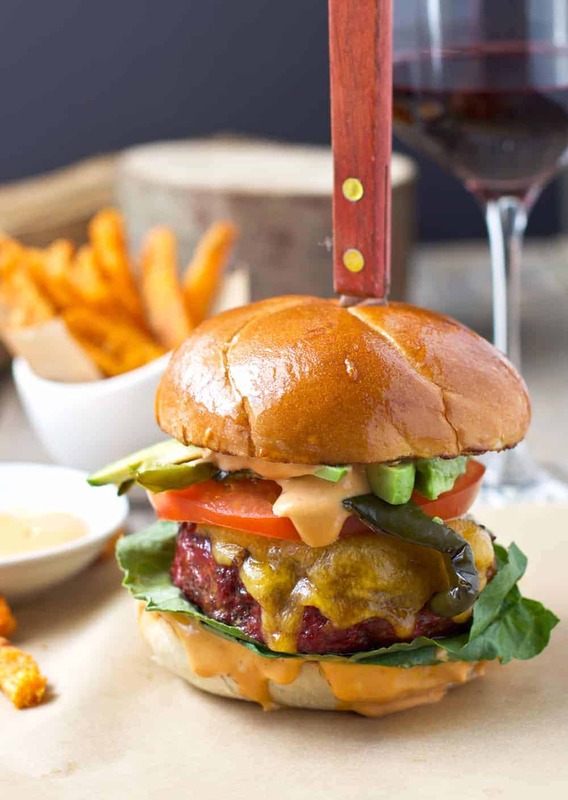 We’ve been smoking burgers for some time now (any kind, poultry, beef, salmon, you name it… even veggie burgers! ), and what many smoked burger recipes out there are missing is that awesome char you get from grilled burgers. You know what I’m talking about. That sear you can only get from direct heat. I’ll also be the first to admit that before I started trusting in my digital thermometer I was the queen of overcooking meat. THE QUEEN! 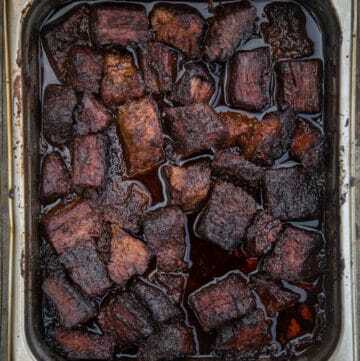 Overcooked meat is such a sad sad thing. My husband is the opposite. He liked everything raw (or at least it seemed that way to me). When Sean got his first grill he served me undercooked poultry twice in a row (he has since fixed that btw). I thought at first he was just trying to kill me off, but since learned that’s just the risk you run when not using a thermometer. He would undercook. I would overcook. 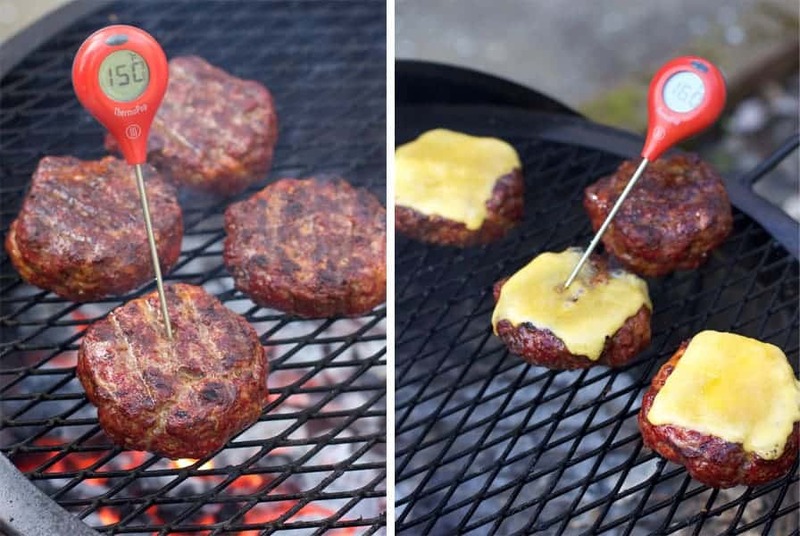 That’s why one of our most critical tools for the grill is a good thermometer. In the end, you cook to temperature, not to time. That means you really need to invest in the right temperature tool. We started out with a cheap old thermometer from the grocery store (basically something that is the same design from the 1900’s). It works fine, but the problem is they take a lot of time to get the proper reading, and they’re also not 100% accurate. Opening and closing your smoker (or oven) lets out heat, so every second you wait for the reading you are losing essential cooking heat! Which is why we now use a digital thermometer, like this (this one is less expensive and works great too), for immediate results. Which brings me back to these burgers. A good burger is many things, but one of the most essential things is that it should be juicy!!! I’m talking like 4 napkins for wiping your mouth and hands kind of juicy. Juicy burgers come from two things — having a good ratio of lean meat to fat, and not overcooking your meat. Fat gives you that juice we’re looking for, as well as flavor! For beef burgers we like to use at least 80% lean and 20% fat (i.e. 80/20). If you want an even juicier burger (who doesn’t?! ), then 70/30 (30% fat to lean) is an even better bet. Local markets tend to carry a lot of 85/15, which is fine too, but 80/20 seems to be the sweet spot for us. 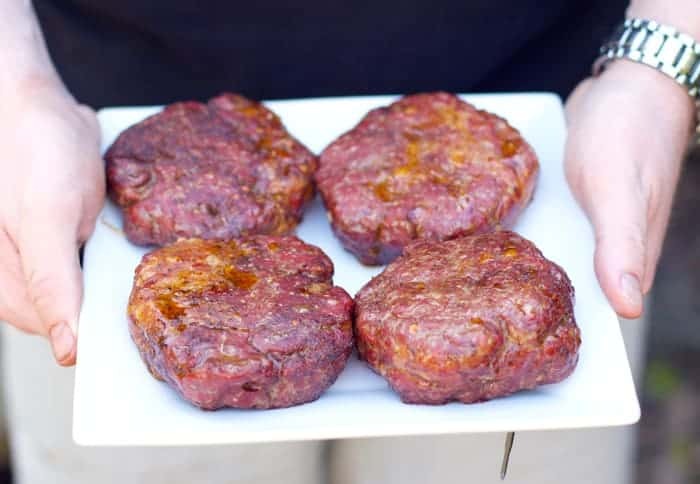 Now when it comes to smoking your meat, we like to make our patties fairly thick (about 1 inch), so that they can stay on the smoker long enough to soak up some of that delicious smoky flavor without cooking all the way through. We smoke them for about 45 minutes at 200-225 degrees. Once the burgers come up to around 130 degrees we pull them off and transfer them to the grill to finish. Now this may sound a bit labor intensive, to use both the smoker and the grill, and, well it is. But it’s sooooo worth it! You don’t have to finish them on the grill. You can totally keep them on the smoker until they reach the recommended temp of 160, but if you want that sear, and I think you do, then I highly recommend you take that one extra baby step and finish them over fire, baby. Once you transfer them to the grill they will finish cooking very quickly, so this is where you need your thermometer to keep monitoring. Don’t let them get over 160, because that’s where you’ll start to loose all that moisture and flavor! This can happen quickly! Once they get to around 150 slap on your cheese, if you’re into that, and let it melt during those last few moments. Once you hit 160 you’re in the safety zone for ground beef, so pull those bad boys off!!! 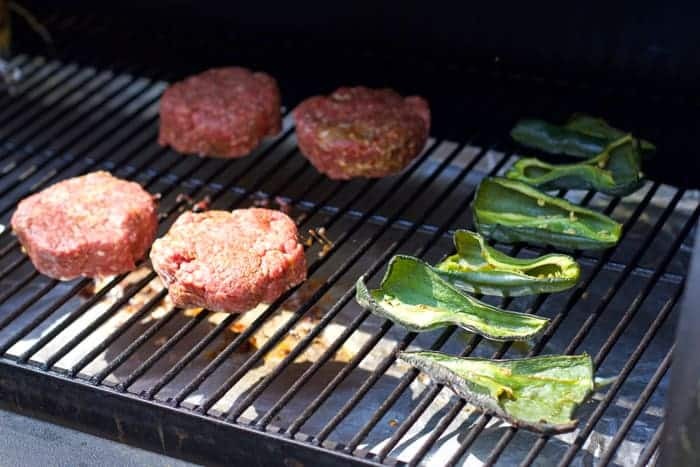 BUT, if you want to try something a-mazing, a touch spicy, and full of ridiculously awesome Mexican flavors, then try this recipe for Smoked Mexican Burgers with Chorizo and Smoked Poblanos. Ahhhh the flavors! The intensity of the chorizo mixed with the beef. The smoky poblanos. The chipotle aioli. The perfectly cooked and juicy meat. The love!!! This, my friends, is the ultimate smoked burger. Warning: this may ruin you from ever going to another burger joint again. When you can make these, you really don’t need anything else. How to smoke burgers with incredible smoky flavor and moisture with the perfect char on the outside. Plus a recipe for Smoked Mexican Burgers with Chorizo and Smoked Poblanos. Prep your smoker to 200 - 225 degrees with pecan or other fruit wood. Combine your beef, ground chorizo, and seasonings. Form into 4 equal size patties (they should come out to approximately 1/3 to 1/2 lb each). Aim for around 1-inch thick patties. Place on smoker for 45-60 minutes until the burgers reach approx 130 degrees (actual cooking time may vary based on environmental conditions. Always use a thermometer to check for proper temp). 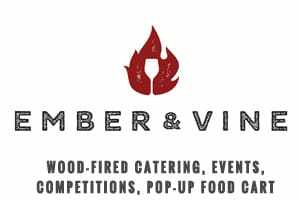 While the burger are on the smoker fire up your grill. 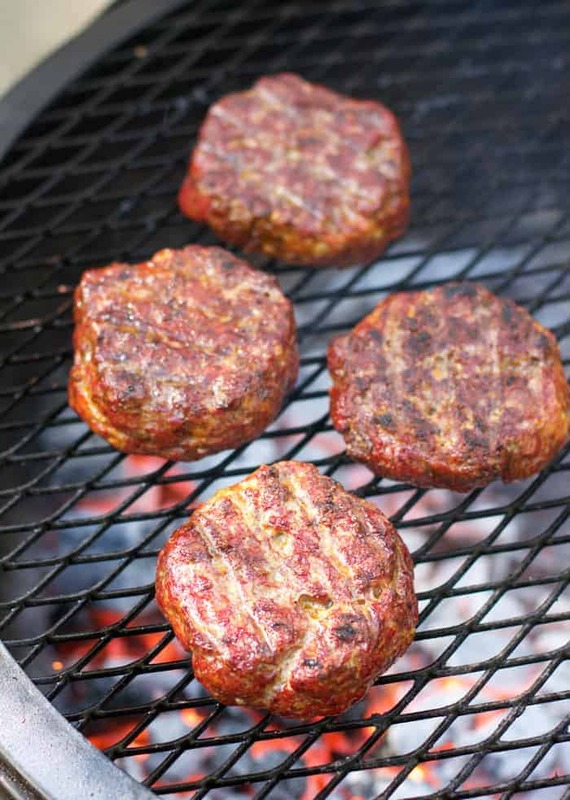 Transfer the burgers to the grill and cook over direct heat until they reach an internal temperature of 160. (Add cheese and let melt around the 150 mark). Remove from heat and add poblano peppers, aioli, and other toppings, to assemble your burgers. Place poblano peppers on smoker while the burgers are cooking. Smoke for 45 min - 1 hour. Mix all aioli ingredients together. Adjust flavors to your preference. If you don’t want it too spicy, go light on the chipotle. For the aioli use just the juice from the jar, unless you like some heat from the actual peppers. If you do, feel free to cut about ½ a chipoltle pepper, finely chop it up, and add slowly to the mixture. For the burgers. If you want to skip the step of finishing them on the grill, leave on the smoker until they reach 160 degrees. If you want to add cheese add it about 5-10 minutes before you’re done cooking to allow it to slowly melt. It will melt slower on the smoker than on the hot grill. These burgers are bold and full of smoky flavors, juicy meat, and a bit of spice. 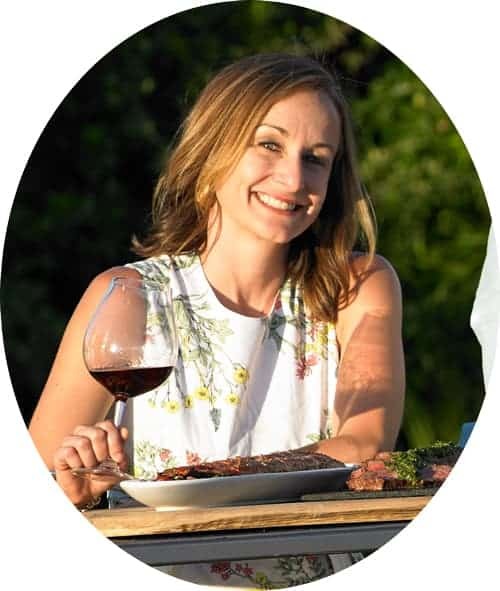 I’m looking for a wine that can stand up to those smoky and spicy flavors from the meat and chipotle aioli, yet not overpower the gorgeous smoke flavors from the tender meat. For something with great flavor, but not too overpowering, I like bolder red wines that aren’t too high in tannin, like Syrah or Malbec. But I wouldn’t argue with a bold flavored fruity rosé to pair with this too, especially in the warm summer sun. 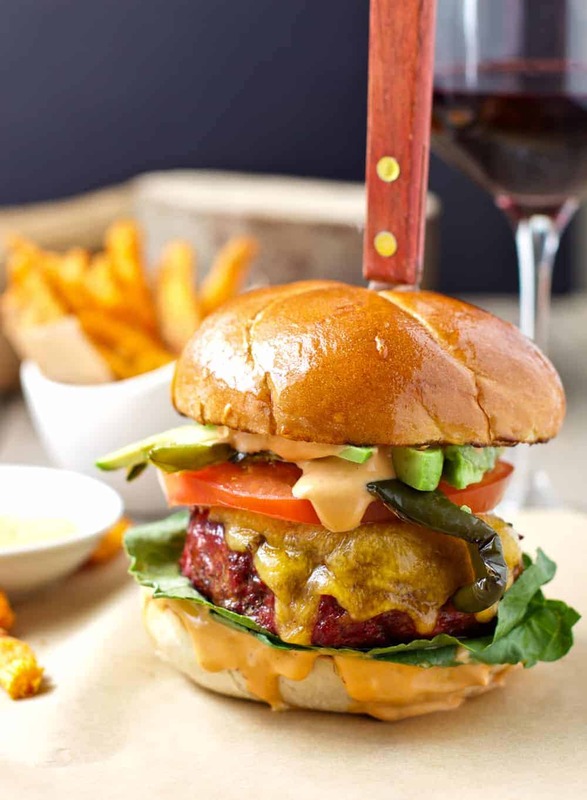 The fruity flavors and colder temperature will refresh your palate between bites of these spicy burgers. Yum! What about you? Do smoke burgers? Have you ever tried finishing them on the grill?? Disclosure: This post contains affiliate links for the ThermoPop and Thermapen digital thermometers. That means if you purchase one of these awesome thermometers we receive a small commission. I should also mention that this is a great time to invest in one of the more affordable ThermoPops. They are having great sale on them right now! ***This is not a sponsored post at all nor were we paid by anybody to write this! 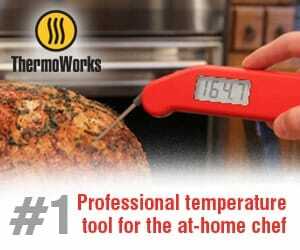 We are just huge fans of these thermometers and have been using our own Thermapen for years. 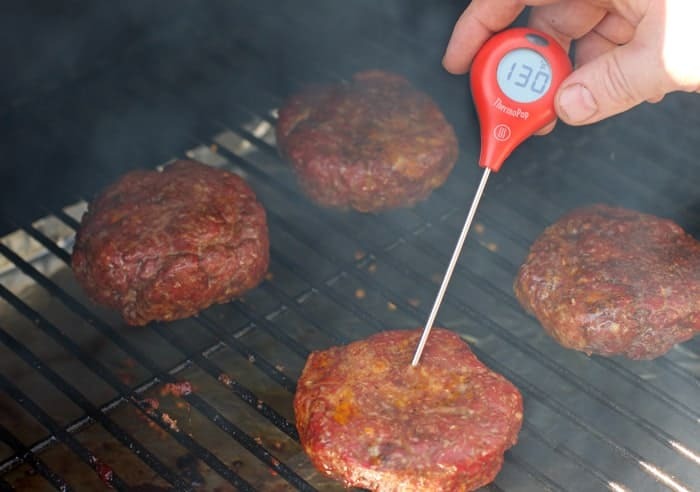 Whether a Thermapen or not, we truly believe a good thermometer is absolutely essential for grilling and smoking meat!! holy moly, that’s a good looking burger! i can almost feel the juices running down my chin and forearms, which is an obvious indication of an awesome burger. nicely done! This burger is making me so hungry and it’s only 7:45 AM! 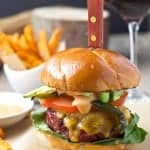 I am definitely making your burger this weekend! Thanks for the recipe. Wow!!! These look amazing and make me wish summer was already here. Beautiful photos. Thanks so much! We’ve had summer weather here in Portland, so we’ve been taking advantage of it by cooking and eating outside as much as we can!! Thanks for the insider tips on making the perfect burger Mary! Now I’m starving! Sorry about that 😉 You’re always welcome here for some bbq goodness! Well those burgers can easily be adapted to indoor cooking too!! You will lose some of the smoke flavor, but there’s nothing wrong with a good pan seared burger, or one cooked on an indoor grill pan!! How about using “healthier” burger I.e. Buffalo, Elk etc. one can have less guilt although not over cooking is even more paramount when trying to achieve a juicy burger..
Jim certainly there are options like ground buffalo/bison/elk etc. The taste will stand out, especially with elk. One item I have found is that the fat content on more lean based burgers needs to be adjusted because they tend to be a leaner meat. If grinding your own meat, you can include the sirloin or brisket meat. If you are buying ground from a butcher, getting the fat included helps to avoid overcooking. Using those types of meats aren’t as forgiving as beef on the grill. My favorite of the game meats is most definitely ostrich! This sounds so yummy! 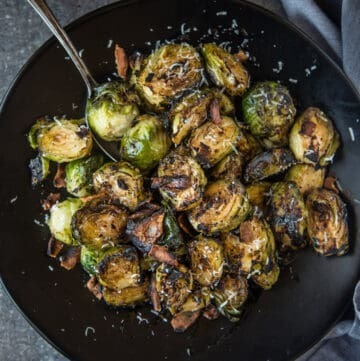 I think the smokiness in this dish would be great! Yum! First I want to say that we love putting everything in the smoker, but it never occurred to me to put the burgers in there! To me, nothing tastes as good as smoked food. Also, that recipe looks divine! I love all those flavors and everything about this post! Thank you! Ahhh yeah, fellow smoked-food-lover! Welcome 🙂 Yes, burgers do amazingly well on the smoker! Never occurred to me either, and we also smoke stuff all the time. I’m slapping my forehead and saying “Doh!” right now. YUM These sound amazing! 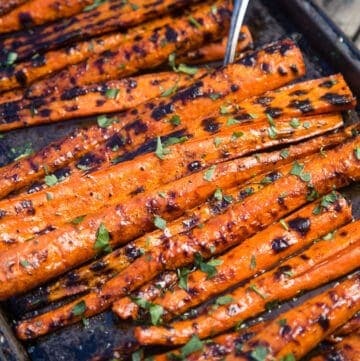 We just got a new charcoal grill, so I’ll have to add this recipe to our list! Oh yeah, you can totally do the entire thing on the charcoal grill too. You can add some wood chips alongside the charcoal to get some of that smoked infusion. I’m seriously drooling! I love your tips too! Pinning this for later! I’m not a red meat eater, but this would be great with turkey burgers. I’m dying to try that chipotle sauce! Yes, it’s totally adaptable to poultry burgers too! That’s what we usually do it for (since I try try try to be more health conscience around here). But with poultry it’s best to cook to at least 165 degrees for safe temp. Luxuriously! How do you think, if I add pickles? Normally would? I’m like you. 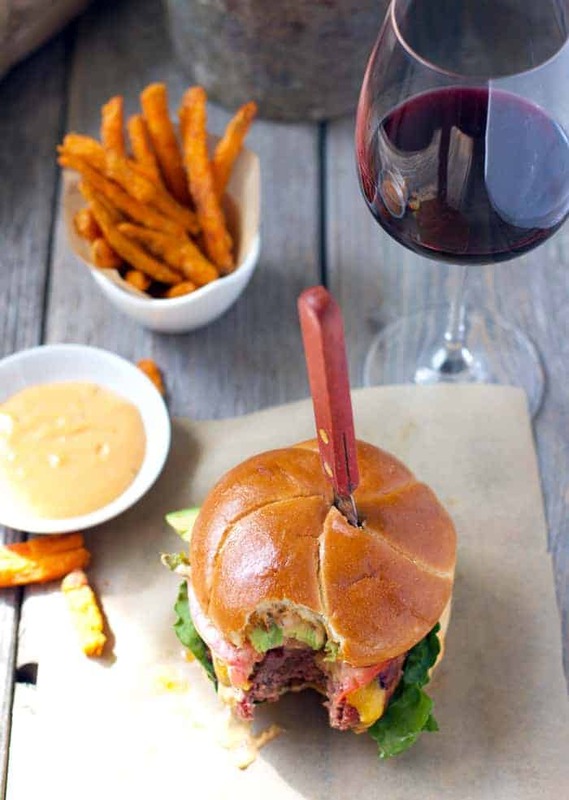 I love a good burger, but getting one done perfectly at home is not an easy task! I will have to start using my thermometer to see if that helps. Thanks for that tip. Yes yes yes, a good thermometer is the key to perfectly cooked meat! Wow! That looks AMAZING!!! I love a good burger. Those burgers look perfect! We don’t have burgers often, and when we do make them at home they are always turkey burgers, but I might have to try this recipe this summer! These look perfect for neighborhood cookouts! These are easily adapted to turkey burgers. And you can always leave out the chorizo if you didn’t want the pork. We usually stuck to turkey too, but when I do beef, I go big!!! These burgers look amazing! I love chorizo but I’ve never had it in a burger. I will have to try this very soon. It adds some awesome flavor! We use Italian sausage sometimes too, for a less intense (and less spicy) flavor. We have a thermometer that tells us the temp at which the meat/veggies are cook at, but we don’t have one that shows the internal temp of the meat. We need one. Thanks for the recommendation and the scrumptious recipe! Ohhhh yes, you do. You’ll never have overcooked (or undercooked) meat again! I’ve never had a homemade smoked burger. This looks absolutely amazing. They are crazy good. Worth every minute of prep. Oh gosh. This looks ridiculously amazing! Great tips!!! Wow that burger looks amazing! I am a huge burger girl. If it wouldn’t kill me I’d eat burgers every day! I love em homemade at the store, at the drive thru lol. I love chillis burgers.I am worried this recipe might have too much of a kick for me. Definitely craving a burger right now, these look incredibly delicious. These are officially going to be our family’s first burgers of grilling season! 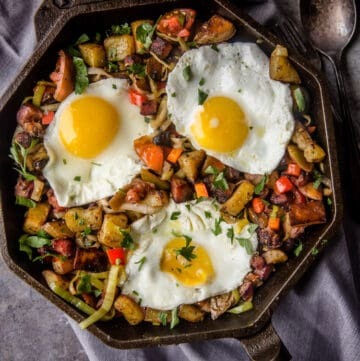 Thanks for the recipe, and congrats on some truly gorgeous food photography! Making this tonight. Made the burgers from 80/20 beef and chorizo we made ourselves from fresh pork ground at home with spice mix from Savory Spice Shop.Smoking on Traeger pellet grill and finishing on gas grill. Since we’re in New Mexico, had to substitute Hat;ch roasted green chile for the poblano (state requirement, Ha). Will let you know how it turns out. Ohhh I’d love to hear how you liked the burgers? I love Hatch chilies. I use them whenever I can find them up here! Sounds awesome! I like the idea of garnishing with smoked / grilled poblano peppers. I might add some caramelized onions. 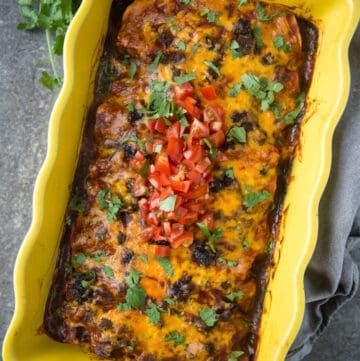 Did you use Spanish or Mexican chorizo? We use Mexican chorizo for these. Mexican chorizo is usually ground, uncooked, meat. Spanish is dried and cured sausage that comes in a casing. Since were mixing the raw meat with the chorizo, I use the raw Mexican pork chorizo to blend into the beef. We just finished dinner. Holy smokes. Best burger I’ve ever done. Used grass fed beef and skipped the bun and cheese. I will add that this burger pairs well with bourbon! Made a few extra and vacuumed sealed for freezer. Thermometer is a must. Awesome!!! I’m so happy to hear the burgers were a success for you!!! Thanks for checking back in and sharing your feedback 🙂 And my husband totally approves the bourbon pairing (it’s his favorite!). I have 2 questions should i use mutton instead of beef and home made mayo? Feel free to use whatever ground meat you like! We haven’t done alot of mutton, and as for mayo absolutely! Anything that is your personal touch and flavor is a win!